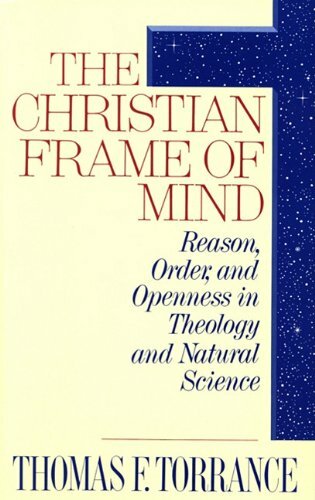 The Christian Frame of Mind: Reason, Order, and Openness in Theology and Natural Science is an exhilarating exploration by one of this century's premier theologians of the relationship between science and theology. This collection of essays, which focuses on themes central to Thomas F. Torrance's lifelong work of integrating Judea-Christian theology and natural science, illuminates the distinctive contribution of the Christian frame of mind to human life and thought particularly in the rise of modern science. Arguing to close the gap between theological and natural science erroneously opened by "the narrow-minded rationalism of the Enlightenment" Dr. Torrance builds upon the work of scientists such as James Clerk Maxwell, Albert Einstein, and Michael Polanyi in promoting dialogue between the two disciplines. The resultant conversation is a brilliant and stirring analysis of common ground in scientific and theological inquiry. Torrance discards a dualist separation for a unitary understanding of reality, in which the invisible guides the interpretation of the visible as scientist and theologian alike adopt self critical openness and the auditive mode of inquiry in response to the pressing questions of their task. Dr. Torrance urges this unitary understanding of the intelligibility of the universe as a shared goal of science and theology. His vision of a foundational convergence between them, where the "boundary points" of contingent reality find their reference in the transcendent, uncreated reality of the Word of God is breathtaking in beauty and scope. The introduction by Dr. W Jim Neidhardt, physics professor at the New Jersey Institute of Technology, provides a lucid summary of key themes in Torrance's lifelong integrative work. Thomas F. Torrance (1913-2007) was born in China in 1913 to missionary parents. For nearly thirty years until his retirement in 1979 he was Professor of Christian Dogmatics ("Systematic Theology") at the University of Edinburgh, Scotland. A prolific writer on many topics, he has published numerous books and papers on the "Philosophy of Theology" dealing with the epistemology of theological concepts and with the relation of theology to natural science. In 1976-77 Torrance served as Moderator of the General Assembly of the Church of Scotland, and in 1978 he was awarded the Templeton Prize for Progress in Religion.